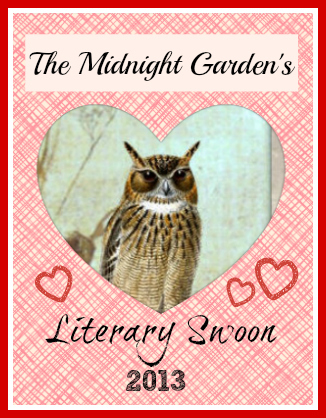 We would like to thank you all for celebrating with us this year’s Literary Swoon series. It’s been a pleasure reading some of our favorite YA authors’ favorite romantic scenes and discussing them with you. Today, we end with our very own personal picks of romantic scenes. We hope they make your hearts beat as fast as they have obviously made ours. Please beware that there will be spoilers. The final paragraphs of Libba Bray’s The Sweet Far Thing is one of the most poignant moments I think I’ve ever read. This series is about growing up, accepting change, claiming your rights and your dreams. It is about self-worth, courage, and love. I could write an entire post about why reading the closing passage of this book makes me want to move and take on the world; why it makes me want to throw myself at love and possibility. Gemma and Kartik face extraordinary challenges and yet they do not falter. They share their strength and with these words, I feel Bray expertly tugging at my heartstrings. When I dream, I dream of him. For several nights now he’s come to me, waving from a distant shore as if he’s been waiting for me to arrive. He doesn’t utter a word, but his smile says everything. How are you? I’ve missed you. Yes, all is well. Don’t worry. The day is breaking free. It bathes everything in fierce light. Kartik is fading from view. No, I call. Come back. But I can’t see. It’s too bright. You can’t hold back the light, Gemma. I’m here. Trust me. The light is so bright it hurts my eyes. But I don’t dare close them. I won’t. Instead, I try to adjust to the dawn, letting the tears fall where they may, because it is morning; it is morning, and there is so much to see. When it comes to romance, I am a very picky customer. I need something emotional. Something visceral. Something that will make me shiver and ache and smile, and maybe even cry for the characters. Which is probably why I loved Gayle Forman’s If I Stay / Where She Went duology so much. The story so eloquently painful, you feel everything as acutely as the characters do. And I uhh… yeah, I definitely feel something for Adam. In this scene (SPOILER ALERT) Adam sees Mia for the first time since she disappeared from his life after the tragic events of If I Stay. A lot has changed for him; he’s become a celebrity, well known for the painful and angry songs he’s written about Mia leaving him. He’s angry, but still wants her so much it makes him feel unhinged. I mean… gah. *fans self* If that’s not swoon, I don’t know what is. Sometimes you love another person intensely, but you just can’t be with them. 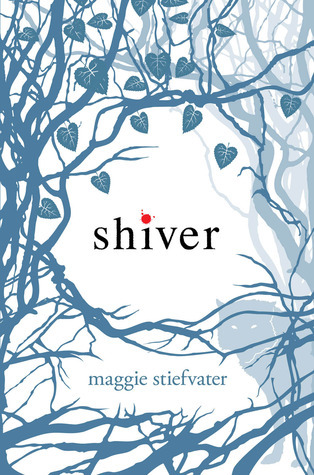 Shiver by Maggie Stiefvater is the story of a boy who becomes a wolf in winter, and the girl who loves him. It’s an agonizingly beautiful book, full of quiet tenderness and heartbreak as Sam and Grace spend time together before he becomes a wolf forever. In one of the pivotal scenes towards the end, Sam feels he’s losing his struggle to stay human. Sam cupped my face in his hands and looked me in the eyes. His eyes were yellow, sad, wolf, mine. That moment, when he knows he’s losing himself and is desperate to maintain some human connection with the girl he loves, makes me cry every time. (I teared up just typing this!) Can love survive impossible circumstances? If you read Sam and Grace’s story, it isn’t hard to believe that love is always within reach. Occasionally I’ll put a hand on this book when I pass by my shelves and I swear–sometimes I think I can feel its heart beating. Now you tell us your favorite romantic scene! Leave comments below telling us which love-moments have stayed with you and why. We hope you’ve enjoyed reading all of the romance we’ve shared over the past week. And once again, have a lovely Valentine. 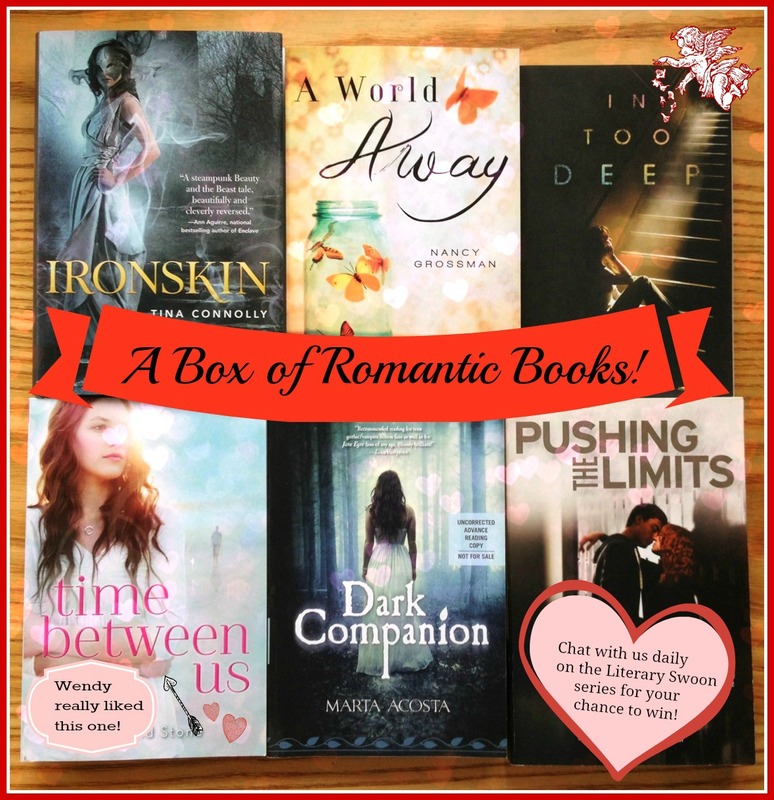 Check out the rest of the Literary Swoon series & win a box of romance! 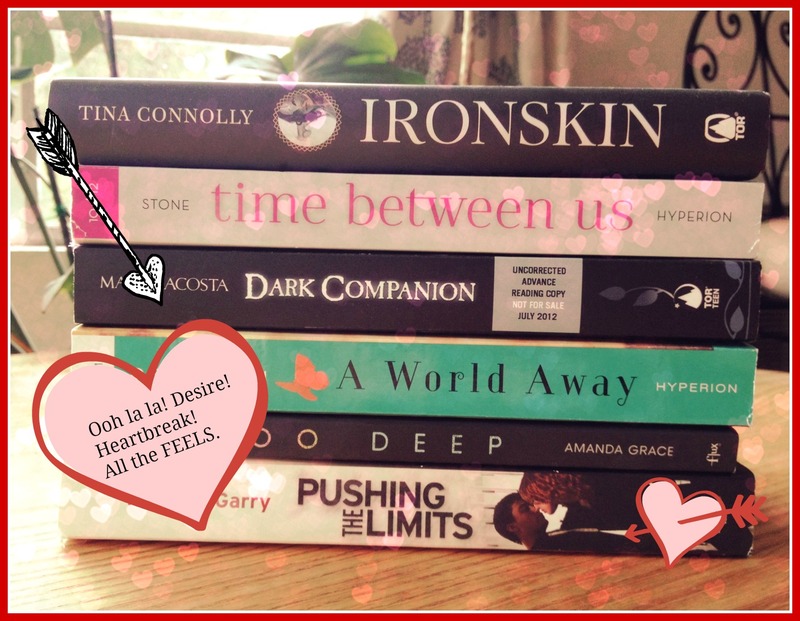 Talk to us about what you think of the romantic choices daily–we’ll choose our favorite comment on each of the posts, and the 6 finalists will be entered into a drawing to receive a box filled with romantic books! The box will includes recent releases featuring love-struck couples, as pictured. You have until Friday evening, February 15th to record your comments on each post for them to count. Love those swoony moments. I love the entire chapter 62 of Unravel Me by Tahereh Mafi. That made me swoon! AWW GUYS THIS POST MADE ME TEAR UP A LITTLE AND GET ALL MUSHY INSIDE. K, I haven’t read that one by Libba, but from what I’ve read of hers, I know I’ll love it, and that excerpt? Beautiful. Her writing never fails to impress. Tonya, LET’S BE FRIENDS! Any fan of Gayle Forman is a friend of mine. :P ;P I haven’t read her latest book, DLMG, but I WANT TO SO BAD OMG. Lovely excerpt. And lastly, Wendy- I saved this for the last part of my comment because I know I’ll start tearing up just THINKING of Sam. *sniffles* Beautiful. Aching. Raw. Honest. I could think of a hundred words to sum up what I thought of that particular scene but then I’d be here forever. Holy hell, there are so many! Well, I have to say if I had to choose one, it is reading when Raffe followed Penryn in the car and the end of Angelfall. I fell apart when I read it. And for Tonya – If I Stay is freaking AWESOME! I have Where She Went – I need to read it. You all mentioned so many FABULOUSLY ROMANTIC and swoon worthy books/scenes my head is spinning! Ill be honest, I am more of an action/horror/supernatural gal myself, but every so often a seriously sweet and heart thumping book will eeek its way into my hands and I cant ever forget it. I know this is one a lot of ppl talk about, but The Fault in Our Stars by John Greene really, really impacted my life and heart. Everyone posting here gave me so many more choices to read about now. I never read any of the Shiver series. I did like the Vampire Kisses series for romance. I also loved the romance in Divergent. The book BETA had a sweet romance too. I adore the look of your blog btw. I think she makes FABFABFAB designs. I loved Where She Went and it was SO sweet and romantic! I would pick Sanctum by Sarah Fine. There’s just something about Malachi. He will give up EVERYTHING for someone he cares about and he’s been through SO much and DESERVES his break, but yet he’ll give it up in a moment. He was also SO strong for others when you know that he just can’t have much left in him. Such an amazing guy and character. “I raise my left arm and twist my neck down to rip off the pill on my sleeve. Instead my teeth sink into flesh. I yank my head back in confusion to find myself looking into Peeta’s eyes, only now they hold my gaze. Blood runs from the teeth marks on the hand he clamped over my nightlock. “Let me go!” I snarl at him, trying to wrest my arm from his grasp. AND YES. That scene. SO MUCH SWOON. <3 Peeta. Fave scene? Well as far as romantic/ swoony it would be the forest bed scene between Joe and Lennie in The Sky Is Everywhere. SO PERFECT. Ahh, yes. Chapter 62. I didn’t love Unravel Me as much as I did Shatter Me, but that scene. UNF. I think I’m switching teams, haha. I haven’t read The Sky is Everywhere, but it’s been sitting on my TBR for YEARS. Everyone raves about it. Must get to it. I skipped the first two because I haven’t read the series and I don’t want to spoil it for myself, but as much as I didn’t feel that affected by Shiver being like/dislike I can see entirely why you picked that scene. It managed to tug on my heartstrings between those two and the fact that Sam was leaving and the pain in his voice. You could certainly feel the love between them and I think your choice of quote captures the strained love that remain between those two and the desperation in it. I did get a little teary eyed reading Shiver. Great picks. I’ve loved this event. 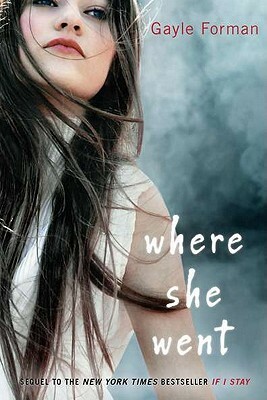 Where She Went…gosh that book left me in so much tears! Thank you for hosting such an awesome event! I don’t think Gayle Forman knows how to write without bringing us to tears. ;) And that scene just kills me. Shiver is the only one of these books I’ve read and I agree that this is a great scene-I really love the whole trilogy and am glad for its introduction to Stiefvater’s writing. I knew I would click with you guys better, hah. I have yet to read ‘The Sweet Far Thing’ but well, ‘A Great and Terrible Beauty’ had me wanting so much more of Gemma and Kartik already. I love that their romance is slow building but yet they both know that they are attracted to each other. So refreshing and different from most YA novels I have been reading. I know exactly what you mean. It was so hard for me to even introduce the Where She Went quote without being reduced to shouty caps and sighs. Followed you over here from Goodreads. Great series. I’ve enjoyed reading the authors and yourselves favorite romantic scenes. I agree with Lauren above, The Lumatere Chronicles by Melina Marchetta have some of the most swoon-worthy moments. Oh, wow. I’ve never even heard of that one, but that quote gave me shivers. I’m definitely adding it to my list now. …AGAIN THE MAGIC by Lisa Kleypas. Oh my God. Shiver was just… And that scene… I could barely read because everything was too blurry. And If I Stay… And freaking Adam… I can’t even… Too many feels. I love Gayle Forman so much. I was surprised no one has mentioned If I Stay and Shiver yet. Those are one of my favs. Then The Fault in Our Stars. I know. Not so original but that was just too much. I love the this one scene in Book Thief as well. It’s not so much a *romantic* scene because they don’t end up together but the part where Liesel finds Rudy dead and she’s can’t even and she finally gives him his kiss but it was already too late cause he’s dead and Death is all, (paraphrasing) “I like to imagine Rudy’s soul was looking down on the scene with a smile on his face.” or something like that. Who could honestly say they weren’t crying at that part??! WHO?! I know exactly what you mean. So hard to make coherent words about Shiver and If I Stay/Where She Went. Wendy and I were just talking about how we need to read Book Thief! Awwww…I’ve never read Shiver but I nearly teared up just from those words alone! TONYA MUST BE TRYING TO KILL ME. I’ve tried to stay far,far away from Where She Went because the last time I read it (or ANY scene from it) my heart broke and I cried. IT HAPPENS EVERY TIME. Gayle Forman is great at making us cry, isn’t she? Those two books killed me. Literal chest heaving sobs while reading, and I’m not even a crier! Shiver is such a good choice. I fell hard for that book and wish that the sequels lived up to the epic swoon-y goodness of Shiver. And yes, Gayle Forman is also fantastic at writing romantic scenes such as your Where She Went example. Great choices, ladies – now I just want to read all these books again! Wonderful choices! I haven’t read Sweet Far Thing in so long, I am now wishing I had time to go back and read that whole series. Oh Kartik, I will always love you. I could not pick one scene if I tried. I feel like I have a new favorite swoon moment every week. :-) You can’t go wrong with Rose & Dimka though – maybe the “so beautiful it hurts me” line. WOW, amazing choices. I recently read IF I STAY, and apparently I am slacking and need to read WHERE SHE WENT! I loved Adam and Mia so that quote makes my knees all weak! You must read WHERE SHE WENT! It pulls the story together so beautifully (and painfully, of course–this is Gayle Forman we’re talking about). I actually have never read any Meg Cabot, but I see I’ll need to rectify that soon! While I did swoon over Tonya’s choice, Wendy’s quote just absolutely slayed me. I am Team Sam forever. I completely cherish my copy of Shiver. Kartik… oh God… my heart just… aah. That ending. It took me a long time to get over that, but as K. said, it’s a kind of take-on-the-world happy-sadness that claims me when I finish reading the Gemma series, not a sad-sadness. I didn’t really like Shiver when I tried it (stopped before I even got halfway), but I might have had my sassy pants on while reading. It’s always hard to say whether I didn’t like a book or whether it got me at the wrong time–I might have to try it again, since I loved The Scorpio Races. I’ve read so many amazing romances over the years, but one that sticks with me (possibly because I read the book over and over and over during puberty) is the romance in Crown Duel. The book had everything a young fantasy lover could hope for: secret admirers, glittering ballrooms, mysterious tree folk living in the mountains, an evil king, courtly graces, elaborate schemes from multiple parties, a hotheaded heroine who isn’t sure where she fits into things and keeps getting into fights with a particular courtier… *happy sigh* All the interactions strike me as romantic because they lead inexorably on to the great reveal. “Shevreath didn’t say a word. He lifted his pen, pointed at a particular shelf, then bent his head and went right back to his task. Not exactly a romantic scene but I love it for its place in things. Thank you for giving me a reason to spend the past hour chuckling and grinning while trying to find an excerpt. Oh my gosh, when you said it took you a long time to get over the GD trilogy, I couldn’t help but nod furiously! I couldn’t pick up another book for almost a week after finishing the books, that’s how much it affected me…for so many reasons I’ll never have time or energy to write. Anyway, I haven’t ever heard of Crown Duel but I’ll definitely check it out. Thanks! I love Jane Eyre. Such dark and haunting swoon. You really can’t go wrong with it. Glad you liked them, Sam. I recently re-read the Gemma Doyle trilogy, actually…over the holidays. And it was just as amazing and sweeping and painful as the first time. So re-read it as soon as you can! That Where She Went quote gives me shivers every time. I went to an event where Gayle read that scene, and I swear I just about fell out of my chair. Wendy, I was completely surprised by your choice. I don’t know why…it just doesn’t seem like a YOU book. I have so many favourite romantic scenes but I’m going to go with Lyra and Will in the His Dark Materials trilogy. Just thinking of them, the way the ended things, makes me cry. And I loved that last speech Lyra has about particles and light and how they will be join together SO TIGHT. I LOVE Lyra and Will. And yes, there are quotes from that series and that relationship that still fill me with despair whenever I read them. But I’m such a sucker that I even have a couple in my GoodReads quotes, so they show up on the blog sidebar sometimes and make me sad all over again. Um, YES. Please give SHIVER a try–it’s a somewhat polarizing book, since you either love the writing style or you don’t! But we’re pretty big fans here at The Midnight Garden. And oohhh, Jane Eyre! A favorite book of mine, too. And no need for an excerpt, I’ve read that scene to pieces, hah. Oh goodness I had to fan myself after reading this. These are some AMAZING choices ladies. I want to re-read all of them. I especially love Adam and Mia, such pain in that story but also so much swoon. And Sam and Grace. Oh how I love those two so much! What a beautiful story complicated by unique werewolf mythology. I can’t get enough of Maggie Stiefvater’s writing. Wow, that is a beautiful quote from Lumatere, Lauren. I don’t think that particular series is for me, but that scene is pretty swoon-worthy! Thanks for sharing that with us. And yes, Maggie Stiefvater. *sigh* What an amazing writer. I love Tonya’s choice for Adam and Mia, too. THAT SCENE she chose! Phew. I had to bypass your quote, Lauren, because I haven’t read that book yet. I’m sort of waiting, putting it on hold for when I really need a good book. And Wendy, HOW can it be not your thing? Is AWESOMENESS not your thing? Haha! hahaha, K. I had the exact same thought. Melina Marchetta is the pinnacle for me; I can’t get over her storytelling ability. It’s truly mind blowing. STOOOOOOP. I <3 that line (and Sam & Grace) so much. The final lines of THE QUEEN OF ATTOLIA pretty much kill me. Every time. III know! Sam and Grace’s relationship is so beautiful. Fun fact: Tonya and I almost picked the same scene! I really need to read QOA–everyone raves. Everyone. Those are all great!! I am a sucker for romance and I don’t think I could choose a favorite. I have read a lot of really romantic books lately. The Gemma Doyle trilogy, with all it’s faults (especially the third book), will always be a favourite of mine. It’s like when people say that a good song is any song that touches you…this series truly touch me. I’m glad it’s the same for you, Bonnie! Melina Marchetta is my favorite–my scene was originally from Jellicoe Road, but then I realized it was included in last year’s feature! I loooove that quote, Ringo! So swoony, especially after all the push and pull between the two of them before that. I really liked ADORKABLE, and I know K did, too. In fact, I think she’s schedule to write a review for it soon. ;) Thanks for sharing that quote with us here, it definitely works for VDay! Ooh, now I’m going to have to read this. Love that quote. Thanks so much for doing this event again this year! I love reading how different books really Affect others. It always makes my own reading experience brighter. I’m so glad you’ve enjoyed this, Rebecca! It’s always fun to see what different people find romantic. :) Happy Valentine’s Day! I loved Libba Bray’s book. I haven’t read the others yet. One of my favorite romantic couples this year so far is Jacqueline and Lucas from Easy. Loved those two. I have never been able to properly articulate how Shiver makes me feel, because I was just so moved by it. It’s been a couple years since I read it, but I still get this deep ache of…longing? Hope? Fear? For Sam and Grace and their tragically heartbreaking love story. I think “agonizingly beautiful” is about as close as you can get it! I am just nodding my head along with you two. I struggle to tell people exactly why I love it, and end up saying, “JUST READ IT, OKAY?” Agonizingly beautiful is a perfect description. haha! Where She Went made me cry, too–though not as much as If I Stay, which brought full on sobs. But Adam. SUH-WOON. And that scene. Gah. I can’t even deal with it.